The user-friendly Duplo DB-280 Perfect Binder brings professional perfect binding to your desktop with a wide range of book sizes from 1.97″ x 3.15″ to 12.6″ x 15.75″. This machine produces up to 200 books per hour, and is ideal for short-run and on-demand printing applications. All the user has to do is simply place flat sheets into the clamp where pages are gripped automatically and the binding process is started. A double pass over the roughening cutter provides superior notching to ensure superb glue penetration for a perfect bind and its clamping and nipping system also ensures a consistent square bind with every bind. With the innovative features of the DB-280, this machine includes a dust extractor as well as two glue drums that provide a more durable bind and additional glue capacity. With a quick push of a button, the DB-280’s perfect binding capabilities can convert to a padding function where only the precise amount of glue is added to complete perfectly bound note pads. For added convenience and efficiency, the DB-280 features a cover detection mechanism at the nipping station that assures the clamp will not travel back to the nipping position until the cover is place. Operator convenience is further insured with the ability to set the nipping and clamping time and a standby mode that allows periodic interruptions in production while maintaining glue temperature. A safety cover on the notching blade ensures operator safety and a finished book counter round out the user friendly DB-280. If you have any questions or are interested in purchasing the Duplo DB-280 Perfect Binder, visit us at SpiralBinding.com. 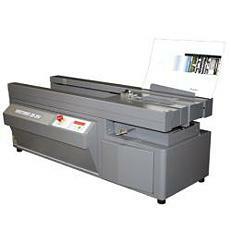 We have great pricing on a full line of Perfect Binding Machines. Call us at 1-800-631-3572 for more information!